Advance Design provides the option to define the mesh in order to correctly simulate the different structural models that can be defined. 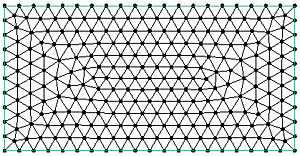 An appropriate mesh definition could make the difference between good results and totally wrong results. ii. 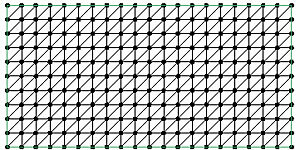 Grid - it is an algorithm which will keep, when possible, a squared mesh distribution. Note: Because of the different structural models that can be defined, the Grid method cannot always be applied with success. 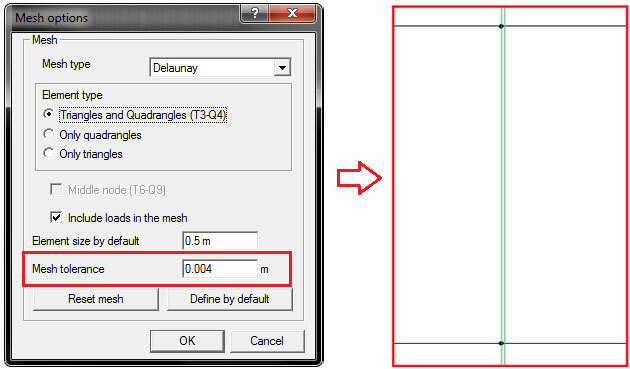 Because of this, when a planar element cannot be meshed in some areas using this method, Advance Design will automatically apply a "Delaunay" mesh algorithm. 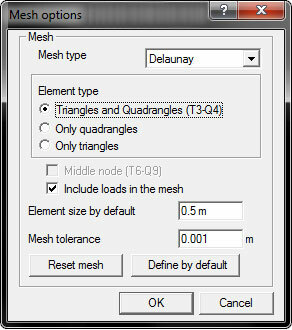 i.	Delaunay - Triangles and Quadrangles - this method ensures that the mesh is done in a way that the geometric conditions are met so that the results can be computed with good approximation; these conditions refer to limiting interior angles of the quadrangle meshes using triangles (45° < α < 135°) and limiting the form coefficients; this method should be used when the element to mesh has an irregular form, contains holes etc. It can be observed that when the element has a regular form the mesh is also regular. ii. 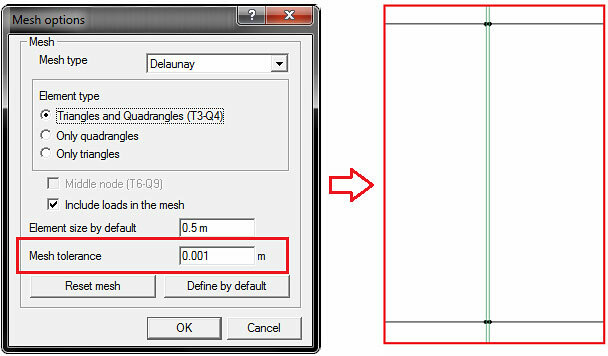 Delaunay - Only quadrangles - this method can also be used with success on any structural form but there may be cases when the general mesh rules cannot be satisfied especially when a large mesh step size is defined and thus the precision will drop considerably. In the case when a large mesh step size is used, you have other options to keep errors at a minimum. 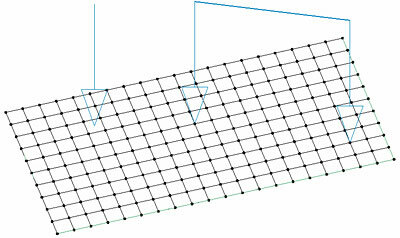 When the element has a regular form no modifications appear in the general mesh distribution. iii. Delaunay - Only triangles - this type of meshing can also be defined for any shape. Note: This method must be used with care, the load state of the element must be taken into consideration and to ensure result correctness a prior analysis must be done on simplified models. 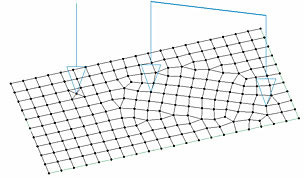 From finite element theory, a structural model meshed in triangular elements will ensure almost the same results as a model meshed with quadrangles when the element is subjected to out-of-plane loads, the planar element is subjected to bending. In conclusion it is best to keep this mesh type only for shell and plate planar elements. iv. 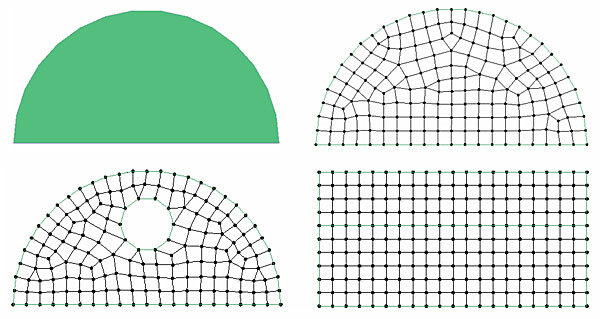 Grid - Triangles and Quadrangles - this method ensures that the mesh is populated with as many regulated quadrangles and where discontinuities triangles and deformed quadrangles will be used. v. Grid - Only Quadrangles - see Delaunay - Only Quadrangles. When this option is active, the mesh will automatically adjust if there are linear or point loads outside the mesh edges (or nodes) by creating specific nodes. 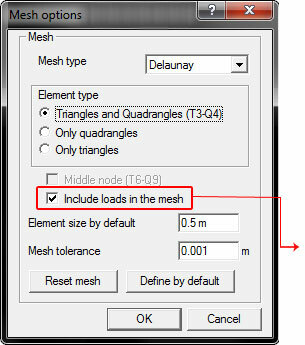 d. Element size by default: - this refers to the size of any side of the geometric form of the mesh for planar elements and the maximum distance between two node points on linear elements. Note: When the element to be meshed has a general form, this dimension will be adjusted lower or higher so that no discontinuities will appear. e.	Mesh tolerance: - this option ensures that whenever two margins of two different elements are distanced by a lower value than the defined tolerance, these elements will have common nodes. 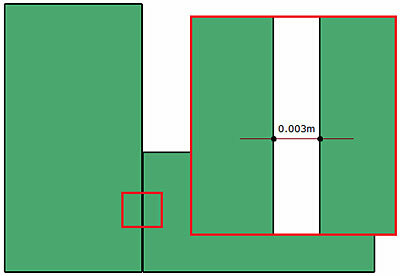 The following example shows a plane element placed at a distance of 3 mm to another plane element. If the default value is kept (1mm), Advance Design will not connect the two elements and each one will have specific nodes. But if the tolerance is modified to a value equal or higher than the distance between them (4mm), Advance Design will create common nodes and the two elements will be considered as connected. By displaying the linear contour you can see the distance between the two elements but only one node is shown at the intersection, which means that the results will be transmitted from one element to the other. Note: Modifying the mesh tolerance must be done with great care because it could have unwanted behavior, for example connecting elements that should not be connected. Always verify the meshed model to ensure structural integrity.